For smoothie recipes featuring the awesomeness of avocado, an ideal ingredient for creamy, delicious, and nutritious smoothies, look no further. Most of the popular diets of the day (vegan, vegetarian, paleo, etc) openly embrace avocados. Their flavor, richness, versatility, and numerous health benefits put them squarely at the front of the class. Read on for the low down on why avocados are such a health supportive food, or skip ahead for three avocado smoothie recipes. The nutrients avocados are high in include dietary fiber, healthy fats, carotenoids, folate, potassium, B vitamins, and vitamins C, E, and K. All of which work synergistically to deliver the following health benefits. Anti-Inflammatory Powerhouse: Several nutrients in avocados help to reduce inflammation throughout the body. For those suffering from arthritis, in particular osteoarthritis and rheumatoid arthritis, regular consumption of avocados can offer relief. Anti-Cancer Benefits: Preliminary studies have shown the ability to help prevent cancers in the mouth, skin, and prostate, likely due to the combination of anti-inflammatory nutrients and antioxidants. 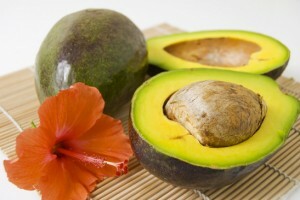 Better Nutrient Absorption: Studies have shown the improved absorption of certain nutrients when consumed with avocados. Reduce Cholesterol: Nutrients in avocados have been shown to help lower cholesterol. Fun “alligator pear” fact: of the dozens of varieties of avocados, Hass avocado is the most common, and the original mother tree is still standing in California. For years I’ve used banana to thicken and provide that signature smoothie creaminess, but lately I’ve been using avocado more because of its superior health benefits. I also feel satiated for longer periods after a creamy avocado smoothie. Note on blending avocados. You might need to add a little extra liquid to your smoothie if you don’t have a powerful blender such as a Blendtec or Vitamix. Here are three of my favorite avocado smoothie recipes. Enjoy! Spices such as cinnamon, ginger, or cayenne pepper. For each of these smoothies, simply add the ingredients into your high speed blender and blend for around for 30-45 seconds or until the desired consistency is reached. Please leave a comment below if you try one of these tasty avocado smoothies. Happy Blending! The result was an incredibly smooth, luxurious blend with a unique and delicious nutty aftertaste. Before devouring, I sprinkled some granola on top. Yum! I love to hear that you did some experimenting of your own. That’s precisely what I encourage everyone to do. Take my recipes and recommendations and create your own unique concoctions. Your avocado smoothie is right up my alley. The creamy consistency avocados lend is delightful, and you can’t beat those healthy fats. I tried the Cherry Chocolate Avocado Smoothie, added 1/2 a very ripe banana, and cut the Almond milk to 1 C, just because I feared it might be too thin for the texture I like in a smoothie. Added a touch of Cinnamon and a bit of sweetener. Oh, and the cocoa powder I used was Special Dark from Hershey’s, which I recently discovered and love. It was a delicious, almost decadently tasty treat. It will become a staple on my ‘what can I have that is too good to really be good for me’ desserts. “What can I have that is too good to really be good for me” – love that! That’s my mission with smoothies, create something that tastes so good you question whether it’s really healthy. I’ve actually been updating recipes and reducing the recommended liquid from 1.5 to 1 cup, which I just did for these avocado recipes. I made these, just used mixed frozen fruit. Added some flavoured whey powder. Love it. I think even children would drink these. I make a lot of your smoothie recipes from your website. They are good. Try it with more sweetener next time, Pat. please how do i make avocado drink with just water,sugar and avocado pear.please i need answer as soon as possible. Simply add all of the ingredients into your blender and blend, Gloria. However, those 3 ingredients alone may not taste that great. Hi,how long can I keep a half an unused avocado in the fridgerator before it turns brown?is it OK for diabetics to put the whole avocado in the blender with the other ingredients to make your healthy smoothies?I am going for a tour of soby’s grocery store with a diatition next week for a refresher on buying better and new ingredients to control my blood sugar a lot better.then I am going to buy some more healthy ingredients to put in my smoothies.I will try your avocado smoothie soon. Half an avocado (leave seed in) will keep for about 24 hours in the fridge. You can trim off the brown. Yes, a whole avocado should be just fine. There’s very little sugar in avocados. Hi,I have all of the ingredients to make the chocolate cherry avocado smoothie including two add one and I am going to make it in my blender on Friday for lunch. Have a nice day and evening and I will let you know how much I like and enjoy this smoothie. Hope you enjoyed the chocolate cherry avocado smoothie, Kim! My avocado smoothie has 1/2 avocado, all the bennies, kiwi, mango, Kale and protein power. It is good for me breakfast and lunch. Thank you for a good recipe. Sounds great, Shelly! I recommend one smoothie a day (typically breakfast) and two regular meals.